Do you like murals? Downtown Raleigh has a couple that most visitors overlook. I want to highlight them so that next time you are close, you might remember to walk a block over and take a look at the cool building art. Click on the pics below to get a larger view and go here for a map. 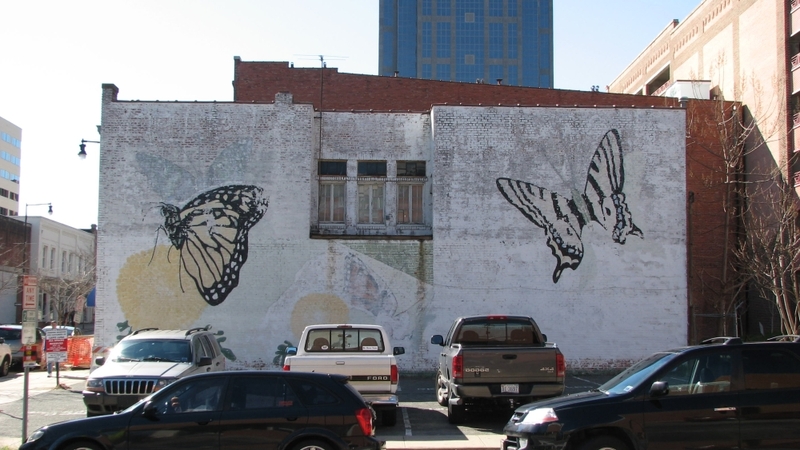 You can find the two huge butterflies plastered on a white wall across the street from Café Luna and Marbles Museum. Head toward the intersection of Blount and Hargett St. to see it. It is very appropriate for this mural of Abe in a Lincoln car to be on the side of Lincoln Theatre. Drive safe and twist that rubber neck of yours to the right when driving on Wilmington St. before Cabaruss St.
I’m not quite sure how to name this one. I guess it is open for your interpretation. You can find this one on Johnson St, across from Hi 5. 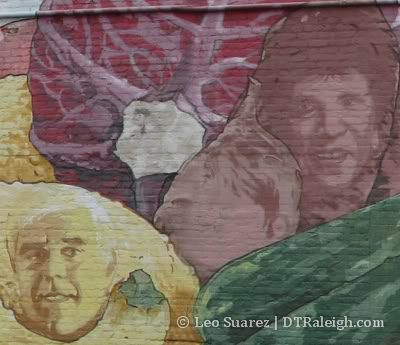 This mural on the edge of City Market looks like a tribute to the farmer’s market. Notice the faces drawn into the fruits and vegetables. Go to the lot at the intersection of Davie and Person St.
Last, I want to show a spot that I think needs a mural. It is the 222 Glenwood parking deck. The blank wall facing Jones St. desperately needs some color. Re the city market one: I recognize coach Yow, but who’s the dude? Nice post….I love those murals. (Especially the butterfly one.) I don’t think I’ve ever seen the Lincoln–that one is really well done! A couple of others worth mentioning is the one of a “southern porch” on that building on the Peace/Glenwood intersection. And also not technically downtown, the Dunkin Donuts building on Hillsborough Street has a nice one, too. Someone needs to approach the owner of that Morgan Keegan building on Glenwood South. 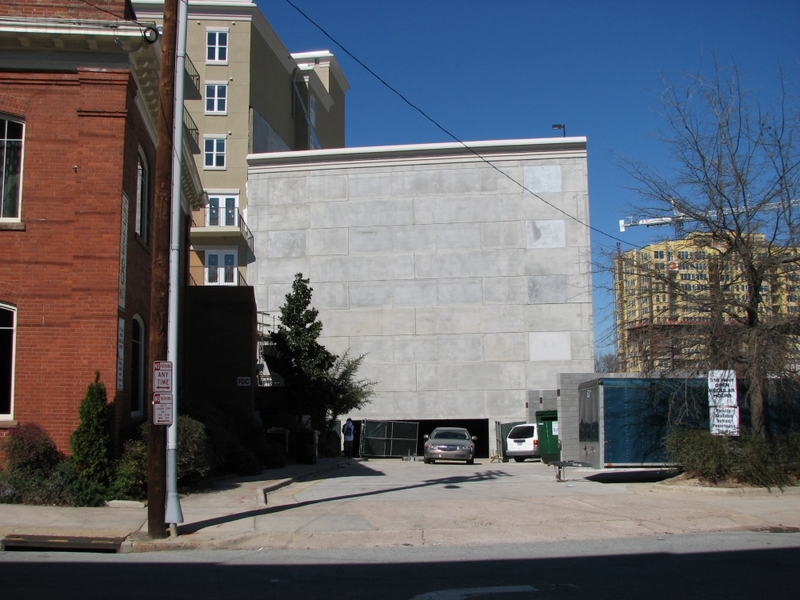 That Grey Elephant parking deck is an eysore (more than any other) coming in from Capital Blvd.. How can the city allow that grey wall to sit there unattended (it looks awful). That ugly wall needs a mural. don’t forget the one on the side of mission valley movie theater. my HS art teacher did that one and he said he painted himself into it somewhere. The mural with the butterfly’s. Remove this building (M&F Bank?) with the empty lot right next to it, great place for a 40 or greater story office/mixed use building.